The Skin Doctors Powerbrasion System aims to help reduce the appearance of wrinkles, sun spots, blemishes, visible pores and acne scarring to reveal smooth and radiant skin with. This triple action home microdermabrasion system removes the dull top layer of skin, revealing a fresher and younger looking skin. To give you professional microdermabrasion results from the comfort of your home, the Powerbrasion system pack includes exfoliating crystals, a handheld microdermabrasion unit, a resurfacing cream and replacement sponge heads. How does Skin Doctors Powerbrasion work? 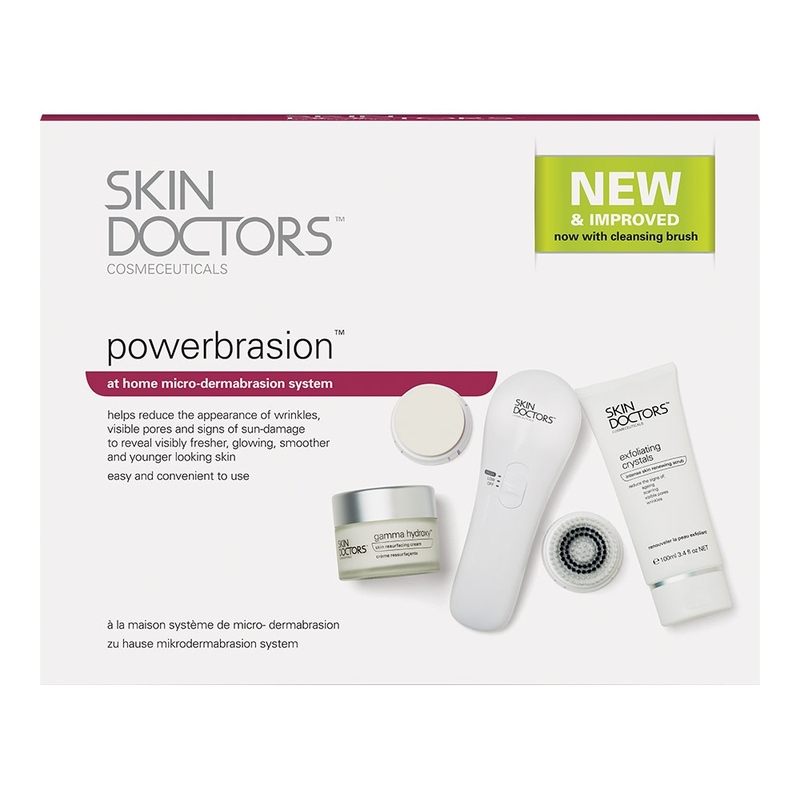 Skin Doctors Powerbrasion System is a two-step resurfacing technique, which combines microdermabrasion and powerful hydroxy acid exfoliation. Microdermabrasion gently exfoliates the top dead layer of skin to reveal the smooth, radiant and younger looking skin lying beneath. The intensive Powerbrasion Crystals gently and deeply exfoliates the skin to help reduce the appearance of wrinkles, blemishes, visible pores and other signs of ageing. The dermabrasion system also uses a chemically active exfoliating peel to cleanse the skin with a mix of Alpha and Beta Hydroxy, helping promote skin renewal from within. Gamma Hydroxy Skin Resurfacing Cream helps loosen the thick outer layer of the skin, which works to give you a fresh and smoother appearance. What does the Powerbrasion system pack contain? This gentle scrub contains microencapsulated beads for powerful exfoliation, without damaging the skin. The crystals contain Melaleuca Alternifolia (Australian Tea Tree) oil and Tea Tree, which helps due to their anti-bacterial properties. It is a hand-held device that sets the beads into micro orbit on the skin for an intense and effective exfoliating effect. This battery powered unit massages the skin surface to help increase blood flow, giving you a radiant skin. The Resurfacing Cream in Skin Doctors Powerbrasion contains AHAs (Glycolic and Lactic Acid) and Salicylic Acid. AHAs works by helping to loosen the thick outer layer of skin, which helps improve the skin texture by reducing fine lines, wrinkles and signs of sun damage. Salicylic Acid in the cream also helps remove dead skin and exfoliate inside the pores to help reduce the appearance of blemishes. How to use Skin Doctors Powerbrasion System at home? Step 1: Cleanse your face beforehand. Step 2: Attach a sponge head to the hand held unit and use a circular motion to massage the skin using gentle pressure. Apply on every area of skin for up to 5 minutes. Step 3: Dust the crystals off the applied area and rinse the skin properly. Step 4: Apply the resurfacing cream and follow with a daily moisturiser. For optimal results, it is recommended to use the system 1-2 times a week. How to order the Skin Doctors Powerbrasion System? Ordering Skin Doctors Powerbrasion is easy and secure with SkinCareTotal. Simply click on “Add to Basket” and proceed to the secure payment. To get the product delivered next day, place your order before 4 pm on any working day.